Based on the entries and the comments, there are most certainly a lot of you out there that worry about your pet's mobility. 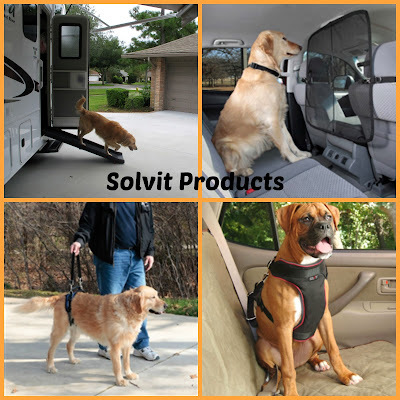 Thanks for reading the review of these terrific Solvit Products and for your participation in the giveaway. I know that our friends at Solvit are proud to have created so many wonderful solutions for pets who need assistance, or to help us enjoy their getting around even more. Today I'm happy to announce our winners. Three entrants will have the opportunity to select one of the items in the illustration above for their pet. The items that are sized, will be sized appropriately for your dog. I'll be in touch with you to collect the information needed, so please watch for your email from AllThingsDogBlog@gmail.com. Check your spam file if you don't hear from me within 24 hours; it may be hiding out there. Congratulations to Theresa S., Linda S. and Shilohsmom. Feel free to make your choice and check the Solvit website pages listed below for size information and measurements required. I'll be in touch and together with Solvit we'll get your pups on the road again. Thanks again for joining us! If you're not a winner today, please check out Solvit's Store Locator to see where you can purchase the Solvit product that is needed in your home. Best wishes to you and your pup. CareLift Lifting Harness: 2 adjustable sizes fit 35-130 lbs. See chart for assistance. Front Seat Net Barrier: Keeps Fido from entering the front seat area and is designed to fit all vehicles with headrests. I received a sample of the UltraLight Bifold Ramp to review with Tanner. I have not been paid to share my thoughts and the opinions are completely my own, as well as observations of Tanner's experience. I only share the reviews of products in which I find value and usefulness. I'm so excited to have won. I drive a lot of rescue transports, and the ramp will be perfect for getting older dogs or those with mobility issues in and out of my minivan (and also in and out of the other drivers' vehicles). Wow! Congrats to the winners! Ive actually been looking for a mobile solution for my dog goku. can anyone tell me where I can find the harness that the boxer is using?? Thanks! !